Every 60 seconds, a child dies from malaria, a deadly yet preventable and treatable disease. 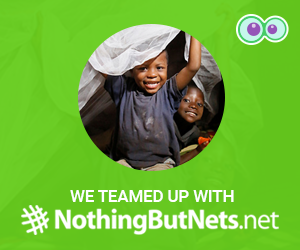 Camfrog has partnered with the United Nations Foundations’ Nothing But Nets campaign, the largest global, grassroots campaign to save lives by preventing malaria, a leading killer of children in sub-Saharan Africa. For every Virtual Gift or Sticker pack purchased, Camfrog will donate a portion of the proceeds to this campaign. Malaria kills. Nets save lives. Send a net. Save a life. ← Camfrog Referral Bonuses DOUBLED through August! Nice Idea and I will support for this campaign to save children’s lives. strongly agree.. good camfrog !!! Lets Buy For support this campaign . Stickers are cool and fun. It is really nice to log on CF and see something so positive for both charity and caring about children. Great idea and lifting everyone’s spirits. lets help the children guys .. buy and support the mission of camfrog..